There’s an arc to the sitcom Christmas episode that’s hard to bend any other way, even for the most non-conformist of shows. One week in December—or at odd times in syndicated repeats—the holiday season just busts out all over a sitcom’s set, wreathed in blinking lights and tinsel bunting, giving the characters something new to react to. Maybe they’re disappointed that they can’t go home for the holidays. Maybe they’re having trouble finding the Christmas spirit, or have a friend who’s similarly grouchy. Whatever the complication, it’s most likely going to resolve in favor of the yuletide, because more often than not, television means to welcome us and warm us—especially when no one else will. During The Bob Newhart Show’s six years on CBS (nearly all of which were spent in Nielsen’s Top 20, but rarely in the Top 10), the series defied a few conventions. The Bob Newhart Show was half domestic sitcom and half workplace sitcom, but both halves were sparser than usual, with the domestic part following a childless married couple and the workplace part set in an office suite with only one actual employee. In most episodes, Bob Newhart, as Chicago psychologist Bob Hartley, would deal with some trifling inconvenience, compounded by the eccentrics and neurotics who’d wander in and out of his life. The dryly titled episode “Bob Has To Have His Tonsils Out, So He Spends Christmas Eve In The Hospital” was written by Tom Patchett and Jay Tarses (the latter of whom later became a pioneer of the “dramedy” in the late ’80s with The Slap Maxwell Story and The Days And Nights Of Molly Dodd), and directed by James Burrows (who remains the go-to guy for classy sitcom directing). It first aired on December 20, 1975, less than a month after the classic season-four Thanksgiving episode “Over The River And Through The Woods”—the one where Bob and his friends get drunk and order a bunch of Moo Goo Gai Pan. “Bob Has To Have His Tonsils Out” is nowhere near as funny as “Over The River,” but it’s a more typical Bob Newhart Show episode in a lot of ways, and more revealing in how it hits the standard Christmas-episode beats, albeit in its own jazzy fashion. The episode begins with Dr. Hartley seeing one of his regular patients, acerbic misanthrope Elliot Carlin (Jack Riley), who’s complaining about the Christmas presents he has to buy and the presents he won’t be getting—since he doesn’t have any friends. But Bob is too distracted by a sore throat and decides to go home early to see his doctor, who tells him that he has tonsillitis and his tonsils will need to be “yanked.” Bob objects to the terminology, but his wife Emily (Suzanne Pleshette) reminds him that children have this operation every day, and that she herself had her tonsils out when she was a girl. Yes, but, “They’re careful with kids,” Bob grumbles. Howard and Jerry’s childish behavior exemplifies what’s so unusual about The Bob Newhart Show. When Howard tells Jerry not to hang the ornaments too low just in case Santa brings him a puppy, or when he asks Emily what he’s suppose to do with all the cranberry sauce he bought to put on the tree, the show leaves it open whether Howard’s kidding or whether he actually is that much of a weirdo. (Credit the distinctly strange character actor Daily for Howard’s hard-to-pinpoint mix of naïveté and dry humor.) Emily’s answer to Howard’s cranberry-sauce question, though—“Make a wreath”—is typical of the way she and Bob respond to all the lunacy around them, via blank-faced sarcasm. The Bob Newhart Show was different than most domestic sitcoms of its era in that its main characters weren’t wrangling precocious little kids. But the people they dealt with on a daily basis were so childish that the end result was often much the same as it would’ve been if Bob and Emily had a brood. In the absence of the young, the middle-agers filled the gaps. Sitcoms abhor a void. Newhart was an unlikely star, even in an era when ordinary people and oddballs had more of a shot of breaking through in movies and on television. Born and raised in suburban Chicago, Newhart had an ordinary middle-class Catholic upbringing, and worked unremarkable office jobs in the ’50s until he befriended advertising copywriter Ed Gallagher, with whom he started improvising sketches over the phone. In the sketches, one of them would pretend to be someone with a ridiculous problem and the other would be an unflappable “company man” trying to talk him through it. When Gallagher had to abandon the act (before it really became an act), Newhart retooled the routines into a one-man show, in which he’d talk into a telephone and let the audience imagine some of what was being said on the other end. This wasn’t an original idea—Shelley Berman had been doing a telephone bit for years, as had comedians before Berman—but Newhart’s stammering delivery and his mastery of contemporary corporate-speak was engaging and clever. And it arrived in popular culture at just the right time, providing a softer contrast to the more acerbic wit of Mort Sahl, Lenny Bruce, and Mike Nichols and Elaine May. Newhart’s 1960 debut album, The Button-Down Mind Of Bob Newhart, won a Grammy for Album Of The Year, and topped the Billboard charts. He became a top concert attraction and variety-show guest. There’s a sense in The Bob Newhart Show that in the mid-’70s, the neuroses of modern life—as articulated by advertisers, editorialists, and politicians—had become all that people could talk about. The grown-up world had been rendered infantile by psychobabble. And yet the show still had plenty of heart. Its theme song (co-written by the show’s creator Lorenzo Music and his wife Henrietta) was titled “Home To My Emily,” and for the first three seasons, the opening credits showed Dr. Hartley commuting happily back from his office, through the bustle of Chicago. For the last three seasons, the commute was in the other direction, but in either case, the opening left an impression of connection and continuity, an understanding that as bad as it got for Bob at work, his Emily would keep him grounded, and give him someone to vent to and crack wise with. That was a large part of the appeal of the show, which depicted a marriage so enviable that even the couple’s bed became iconic, as the place where these two were meant to return—even after Newhart and Pleshette went on to do other things. The Bob Newhart Show keyed on an element of Newhart’s persona that many had missed in the ’60s: He could be adorably irritable. Newhart’s early critics preferred to focus on his Midwestern family-man charm; even the chapter about him in Gerald Nachman’s book Seriously Funny: The Rebel Comedians Of The 1950s And 1960s is called “Charlie Everybody,” after Don Rickles’ nickname for his best friend. But Nachman also notes that in private, Newhart can show a cutting wit, and often enjoys a filthy joke. (Newhart has cited Lenny Bruce and Richard Pryor as among his favorite stand-up comedians.) On The Bob Newhart Show, Bob Hartley always started on an even keel, and usually returned to same, but in between he often became as unraveled as his patients. The character was more like Jerry Seinfeld on Seinfeld or Michael Bluth on Arrested Development than Andy Taylor on The Andy Griffith Show. He was also a little like Charlie Brown. In the best scene in “Bob Gets His Tonsils Out,” Dr. Hartley is left alone in his hospital bed, and tries to rest up before the operation by listening to the radio. But the announcer taunts him with a reverie about holiday joy, which then gives way to a test of the local emergency broadcast system. Bob attempts to relax, but gets increasingly nonplussed. 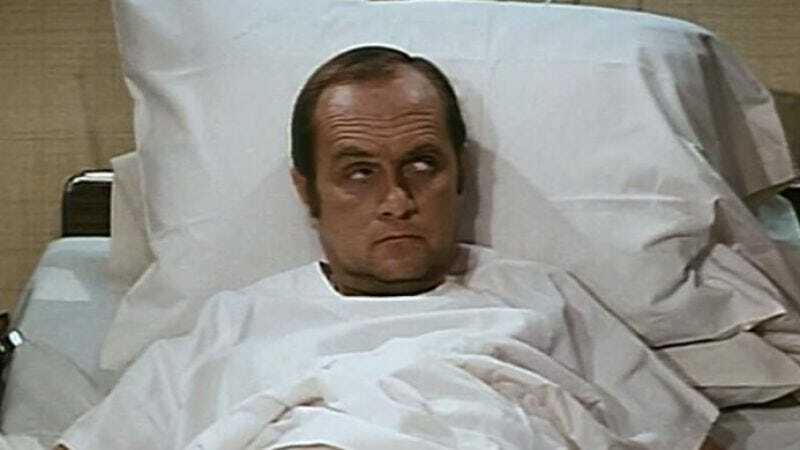 The image of Bob in a hospital bed is perfect for The Bob Newhart Show, and for a Christmas episode. In a hospital, patients are swaddled and catered to in ways they never are in their daily lives—and yet they’ve never felt more miserable, because they’re ill. At Christmastime, people can drive themselves into exhaustion and depression trying to manage all the decorating and shopping, along with the pervasive feeling that the holidays aren’t living up to their expectations. The Bob Newhart Show frequently dealt with that vague dissatisfaction, felt by relatively comfortable adults who still knew that something was missing from their lives. “Bob Gets His Tonsils Out” restores order and affirms Christmas, of course, because that’s what TV is supposed to do—and that’s what The Bob Newhart Show always did, by having Bob come home to Emily. But the peace and goodwill doesn’t come until after a grating warning buzzer sounds at a man who feels sore, sad, and utterly alone.